Location: 12 days north of hopeless, and a few degrees south of freezing to death. The FSS (Fuel Shut off Solenoid) is the way our trucks can turn on and off the engine. First off it is one of the most needlessly replaced parts on these engines. The most common way to kill them is the starter to stick on giving the "Pull" wire power for a long period of time, which produces a lot of heat inside the FSS, and it burns up, you most likely don't need to replace it unless it looks burnt. If your FSS is not working correctly then it's most likely your wiring or a dirty shaft. 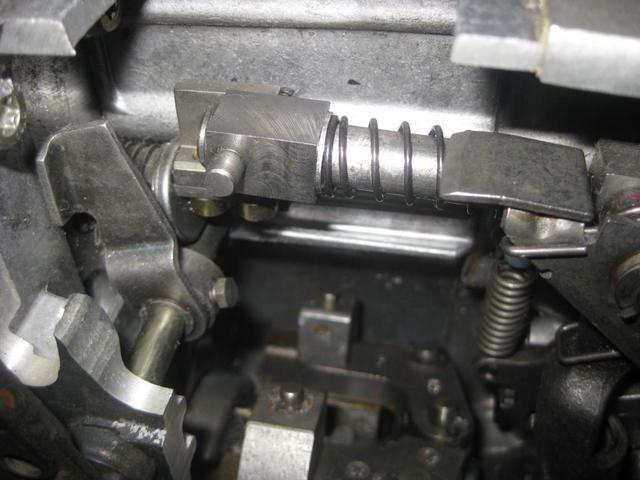 When the FSS lever is down, the Injector lines will not receive ANY fuel. There are 3 wires going to the FSS, Ground, Hold and Pull. "Ground" wire, truck side is black with a orange stripe, FSS side is all black, it is connected to ground all the time. "Hold" wire, truck side is small light green with a black stripe, FSS side is normal sized Red wire, the Hold coil (an electromagnet) gets power when the key is in the run position. Since the plunger is spring loaded to push the lever down (turn off engine). The Hold coil Does not have enough power to pull the plunger up (compress the spring), and only has enough power to keep the plunger up, once it's all the way up (keep spring compressed). So in order for the hold wire to hold the lever up, the Pull coil must bring the plunger all the way up first. "Pull" wire, truck side is Red, FSS side is White, the Pull coil (an electromagnet) gets power only when the starter is engaged. it has plenty of power to pull up the lever (compress the spring), but if it's kept on to long it will create a lot of heat and will burn up the FSS. the Power wire gets power from the FSS relay(Part# SS70A), the relay gets its signal power from the small wire coming off the starter. If you're ever on the road and it shuts off or won't start then you should be able to tie that lever up with a bungee cord, some wire, rope or something. that lever needs to be up for the truck to start. You can test the FSS by trying to start the truck and then leaving the key in the "Run" position, feel under the FSS to make sure it's all the way up, if it's all the way up then it shouldn't be your problem, unless you have a lack of power problem then the lever might not be going all the way up then you can test it by going HERE and check that the arm is really going all the way up, if it isn't it could be that your shaft is dirty or rusted or simply it might not be adjusted correctly. Last edited by Cowboy303; 01-22-2015 at 07:37 PM. notice that the fueling arm (one that touches the AFC foot and fuel plate) does not move because it is up against the low idle screw. And see how if the FSS lever is not all the way up it will restricted rack travel. That is why you need to make sure that the arm is adjusted correctly to allow full fueling. With the Mack plug installed there is 0.2127" of gap between the lever and where it hits the rack. With the Mack plug not installed there is a 0.11" gap. Last edited by Cowboy303; 03-04-2013 at 08:24 PM. 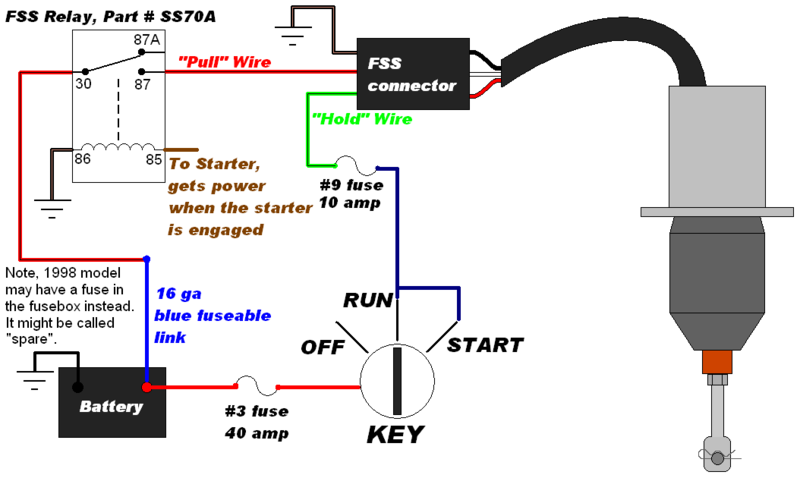 The blue fusible link is a common problem (Diagram HERE), it fuses the "Pull" wire going to the FSS. 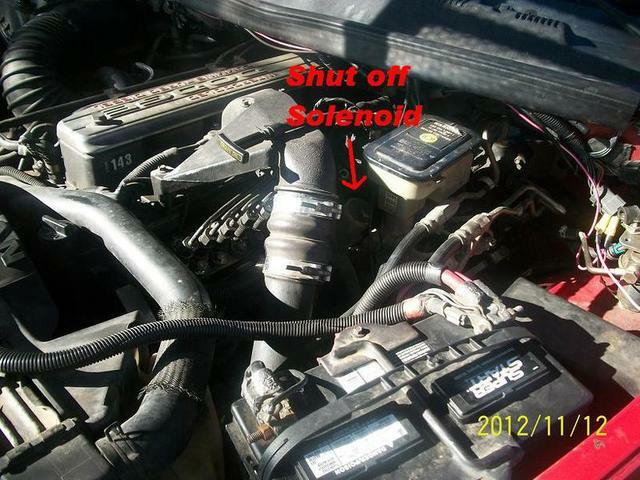 On the 94-97 it is located on the drivers side positive battery terminal. it often gets corroded at the connector or inside the insulation, go to your auto parts store and ask for a "14 ga fusible link" (it might not be blue but that does not matter there both the same) then cut the old one off and use a crimp connector to install the new one. Connections Check the FSS connection and make sure it's not corroded. and check to see what all things you loose when the truck shuts off, gages/lights/radio/etc. The hold wire is fed by the 'green w/black stripe' wire. that's the same wire that powers a bunch of other things. so that's probably your problem if you loose gauges, radio, ect. Refer to the wiring diagram above. FSS Out of adjustment. This isn't very likely unless you just replaced or monkeyed with the FSS. In which case adjust it as needed https://www.cumminsforum.com/forum/94...ml#post5971569 . 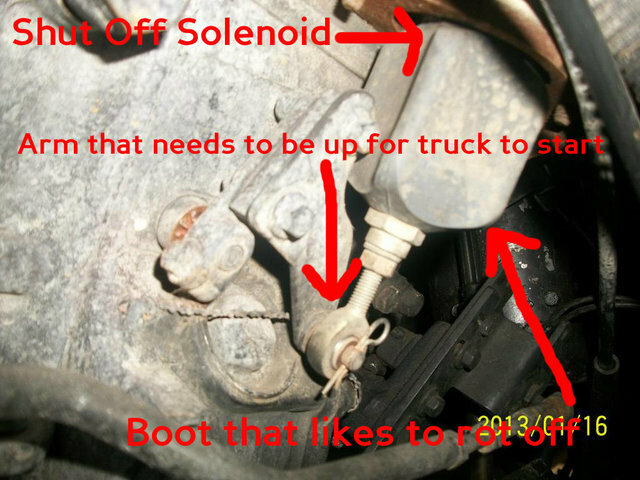 Just like with the rotted boot, if the plunger can't go up all the way because the rod connected to the lever on the Injection pump is adjusted to short, the hold coil will not be able to keep the plunger up, and the truck will shut off once you let off the starter. Won't Shut-Off, or Shut-Off is delayed. If the key is missing, the lever will just spin on the shaft and may not allow the engine to shutdown, or just delay shutdown. Once started, the engine may act normal, or be low on power. 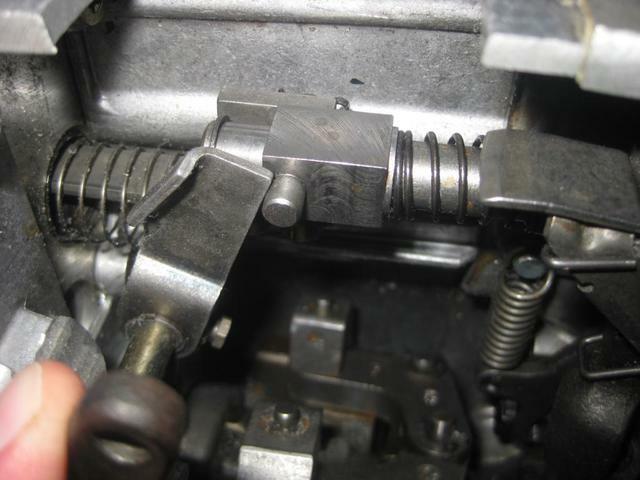 After uninstalling the FSS, You can loosen bolt 'C' in THIS picture to slide the lever off the shaft and insure the keyway is installed as it should be. HERE'S a picture of where the key should be. The Woodruff key part number is Cummins 3920924 or Mopar 04761316. CumminsForum member thecheese429 reported that a 2mm X 3.7mm woodruff key he found at ACE hardware was also the correct size, and could be had for a couple bucks. Last edited by Cowboy303; 07-06-2017 at 10:46 AM. Now loosen up these two bolts that hold on the FSS, take them out about 1/4" or until the end of the bolt is flush with the plate (we want to loosen them but don't want them to fall out, you will know why in a bit). OK we loosened the bolts up, and now have some gap, the arm is spring-loaded so it will want to push the FSS body up. Now turn on the key to the "run" position, Go out to the FSS and and push down on the main part to close the gap and lift up on the lever until it clicks up. The FSS clicks up when the ARM is all the way up, so what you want to do is make sure the Lever is all the way up when the arm clicks up. So sense the bolts holding down the FSS body are loose try lifting on the FSS body to see how high you can lift it, if you can lift it more then 1/8" then the lever is not coming up enough and is limiting fueling on the top end(go here know how it works). How much you adjust it is based on the results you had on step 6, then repeat steps 7-10 until you like how the test performed in step 6 goes. Slip the arm Back on the shaft, before you try, either turn off the key or unplug the FSS (every time you turn on the key the grid heater will cycle if it's under 60* out). If there's something I didn't explain very well or you would like me to add please PM me. Thank you! Last edited by Cowboy303; 07-06-2017 at 10:43 AM. I resently had the FSS relay go out on my 97. So I desided to take it apart, and see what was in it! Taking it apart is simple, there are just four barbs that hold the cover on, so to get in I simply pushed 4 flat screw drivers on all four sides and pulled on one of the big spade terminals with needle nose pliers. Once in, it wasn't hard to find the issue, RUST! From here, we remove the spring sitting on the top in the picture above, and bend the tab in the next 2 pictures picture. Now we can look at the contacts, mine have seen a better day, but still wern't to bad. After some steel-wool and a wire brush. When I put it all back together, I sprayed some "battery terminal protector" in the relay before installing the cover. Hopfully that will help it last longer. When putting on the cover, make sure to install it in the right position, refer to the first pic of this post for orientation. Through it back in the truck and it's worked the couple dozen times so far, we'll see how many miles I can get out of it. '95 2500 ECLB 4x4, 334k and paused due to epic transformation in progress.